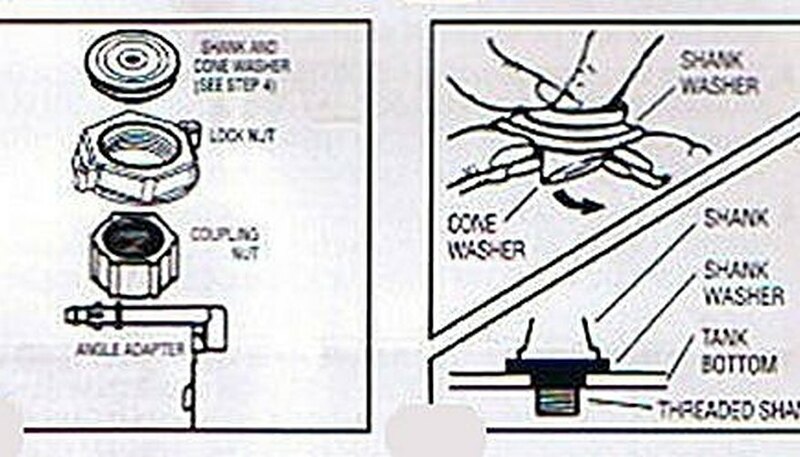 This article shows how to replace a toilet fill valve and make adjustments so it functions properly. The reason these valves need replacing is (1) when they fail they cease to shut the water off or (2) they fail to let the water into the tank. The replacement itself is relative easy. The hard part can be the adjustment. 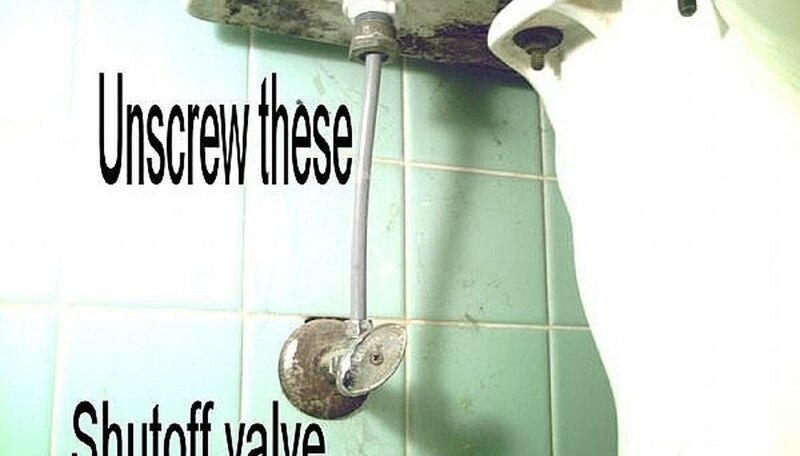 The reason you are replacing this valve is probably because it will not shut the water off. Sometimes it leaks a little bit and other times it can leak a lot. So if it's leaking the first thing you need to do is shut the water off at the wall below the toilet tank. After you get the water shut off you need to drain the tank of water by holding open the flapper valve at the middle bottom of the tank. Mop up the bottom with rags or sponges if need be. 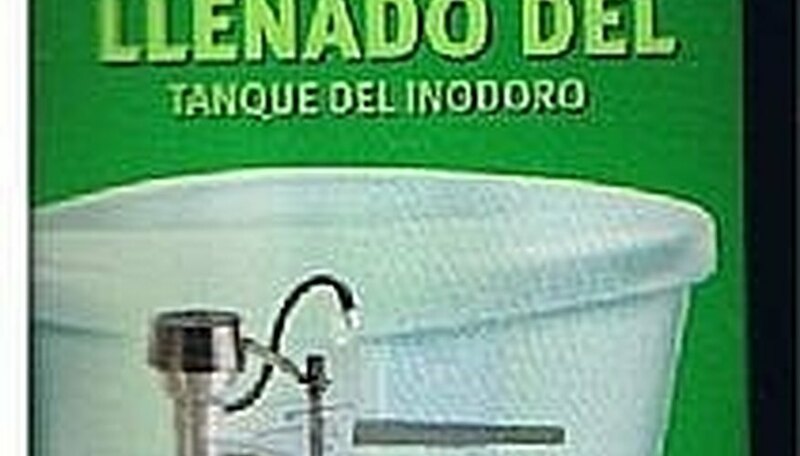 Some toilet installations do not have a shut off valve near the toilet tank. If this is the case you can use the whole house water shutoff or if there is not one of these you may have to shut off the water at the street where the water meter is. In any case you have to get the water shut off before you can replace this valve. 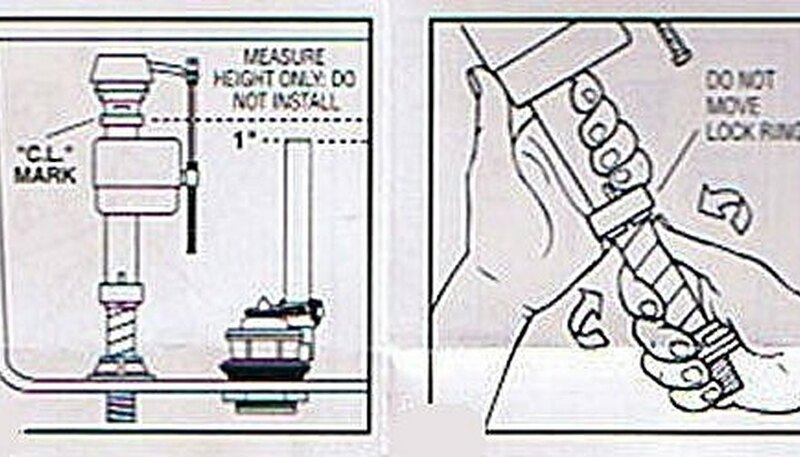 After you get the water shut off, unscrew the nuts at the pipe as shown in the illustration and take it loose. Unscrew the nut at the bottom of the fill valve and lift the valve out of the tank. The new valve will have a little bag of parts which you will need to open up. Cut apart the large shank rubber gasket from the cone rubber gasket, see illustration. The shank rubber slips onto the bottom of the valve. you may not use the cone rubber at all. You must have this seal between the valve and the tank. If you fail to put this seal on you will have a leak after you tighten everything up. Begin the final adjustment as shown in the illustration. The shank will twist up and down until you get the one inch shown in the illustration. Be careful, that collar will come loose. If it does just put it back and it will hold everything together tightly. * Now, stick the valve back into the hole and screw the new nut up from underneath. * Be sure to connect the little hose to the bib on the valve head and to the fitting on top of the stand pipe. If you don't it will come flying out of there when the water comes on, or if not it will drain the tank through a siphon action. It must be attached to the fitting that attaches itself to the stand pipe. 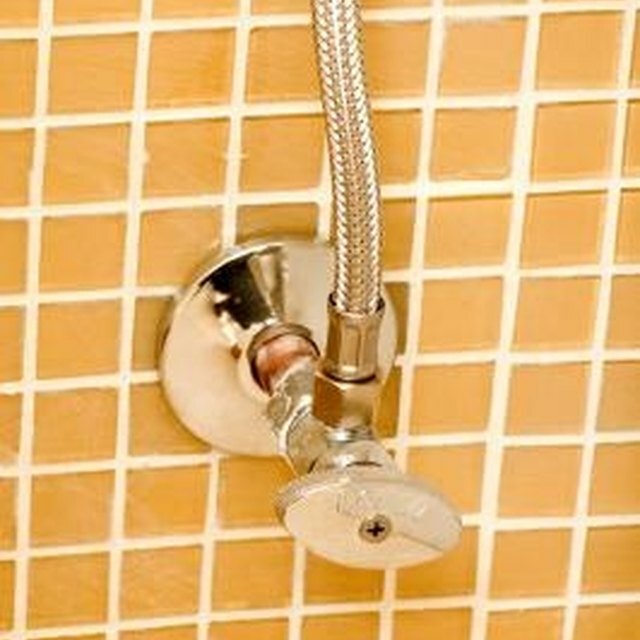 * Put the water pipe back in place using new seals if necessary. You are ready to turn the water back on. * Turn the water back on and get ready to turn it off again in case you have a leak. Let the tank fill up until the water shuts off. The water level should be about an inch below the top of the stand pipe. The water should not be spilling into the stand pipe. If it is, you need to make more adjustments. You can move the float up or down using the float adjustment screw. This float level is what turns the water off at the right place. A replacement valve. This procedure uses a Fluidmaster type valve. There are many different types of these valves but they all perform the same basic function. Mop up rags or an old towel. Don't over tighten the plastic nuts, they can break. There are literally thousands of different types of Toilet Tank Fill Valves. The valve used here will replace nearly everyone of them. The Fluidmaster valves are available at home centers and hardware stores and plumbing shops and of course the internet. Usually there is a pretty good set of instructions that comes with the valve. I would suggest checking the box before purchase to make sure all the parts are there and the instructions are there. Often times the little bag of parts will be missing. Be sure to get the water shut off other wise you can have a real flood.